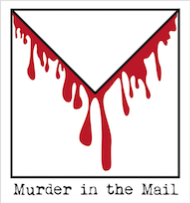 We now have a simple online store for all your MURDER IN THE MAIL and MAGIC IN THE MAIL needs! Melbourne Supanova (April) in the Artist Alley stall "Aussie Spec Fic"
Sydney Supanova (June) in the Artist Alley stall "Publisher Obscura"
There will be limited quantities of the packaged version, so email me in advance if you'd like to reserve one. NB: These dates are based on Australian EST (Eastern Standard Time) aka Sydney/Canberra time. The end dates may come earlier than you expect! The dates listed below are still flexible, with the most flexible dates indicated with (?). You will receive your stories between March and May 2018. If you do not have a PayPal account, you can pay through this link: Paypal.me/MurderintheMail. Each sale requires $40, a name, an email, and a physical address. Be very careful to label your payment with the name, and then send your name, email, and postal address to MurderintheMailStories@gmail.com. If you want (very infrequent) updates on the Kickstarter etc, all you need to do is register on this forum (takes about 30 seconds, and then you can post comments and start threads and suchlike). Kickstarter Campaign! You can buy several different versions of the story and/or other unusual bespoke items via the Kickstarter. Keep in mind that the end will come sooner than you think due to it being run from Australia. Technically you can also buy it using the details above. You do you. Stories and objects will be delivered between June and September. You may order your stories through the Publisher Obscura web site (a link will be posted here), or by emailing MurderintheMailStories@gmail.com, or by coming to the "Publisher Obscura" table at Sydney Supanova (16-18 June) or finding me at GammaCon Canberra (August 4-5, at a table labelled either "Odyssey Books" or "Publisher Obscura"). Or you can direct deposit (with careful labelling) to the account above. Stories will begin delivery in late August/early September. Launch Day! Specific details TBA. There are grand plans afoot! You may order your stories through the Publisher Obscura web site, or by emailing MurderintheMailStories@gmail.com. February 2019 - end May 2019? Kickstarter campaign for the second story? The original, posted version of "A Bloody Birthday" will NO LONGER be available through any outlet. It will be converted to a physical & digital book that can be purchased through Publisher Obscura only.